The comedian, 75, is recognised in the New Year Honours for services to travel, culture and geography following his successful second career as a travel writer and television presenter. But Palin is best known for his time in Monty Python, with which he was involved in classic television and film comedies including Monty Python And The Holy Grail (1975), Life Of Brian (1979) and The Meaning Of Life (1983). As well as TV shows and films, the surrealist group, also consisting of John Cleese, Terry Gilliam, Eric Idle, Terry Jones and the late Graham Chapman, produced plays, books and musicals that became staples of popular culture. They will celebrate their 50th anniversary next year. 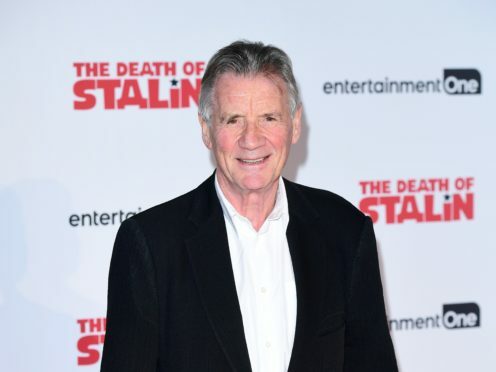 Palin, who is receiving a substantive rather than honorary knighthood in recognition of his contribution to Britain internationally, said being part of Monty Python was “definitely” a career highlight. He told the Press Association: “Discovering there were five other people who had the same sort of sense of humour as myself and we all appreciated each other’s work and that the work that we did, both on television and film, is still being replayed and still being appreciated, that’s quite something, really, after 50 years. Palin was born in Sheffield in 1943 to an engineer father. His first taste of acting came at Birkdale Preparatory School when he played Martha Cratchit in the school production of Charles Dickens’s A Christmas Carol. He studied at Brasenose College, Oxford, before joining up with Monty Python in 1969 for the first series of their Flying Circus show. The group went on to enjoy a phenomenally successful career, with their influence on comedy compared to that of the Beatles’ on music. Following Python, Palin carved out a career as a travel writer and television presenter. His shows have taken him around the world, including to both Poles, the Himalayas, the Sahara Desert, Brazil and North Korea. Palin said he was grateful to have been able to travel extensively and that seeing the world made him realise the UK should not “hide away” from its role on the global stage. He said: “We are a country which has always been at the forefront of exploration and trade. We have an enormous amount of contact here with nations of the world and that’s a very important thing that we must build on and take responsibility for our role in the world. He said to mark his knighthood he may “just have a quiet celebration, just myself and a glass of Horlicks and then go to bed”. Palin, who in 2000 was honoured with a CBE for services to television, revealed he intends to keep working “for as long as I can” and that he is “constantly thinking” about new ideas.